So it might not be the fairytale of William and Kate but I have to admit I love a good royal wedding. On Saturday, Prince Albert II married Charlene Whittstock in a religious ceremony in Monaco. The two had a civil ceremony on Friday, July 1. Charlene Whittstock is a former Olympian. She competed for South Africa in the 4 x 100 meter medley and her team placed fifth. I probably watched it because I am sort of an Olympic-a-holic. There were several high profile guest such as Naomi Campbell and Karl Lagerfeld. Other than his brief appearance on an episode of The Girls Next Door you probably recognize Prince Albert as Grace Kelly’s son. The couple’s wedding cake is pretty interesting. According the the official Visit Monaco Facebook page the cake took over two hundred and fifty hours to make, weighs 50 kilograms (that’s about 110 pounds), is topped with fifty gorgeous white roses and includes sugar cases with Monaco sweet specialties. On each case is the royal stamps and the royal flags are stamped around the base. 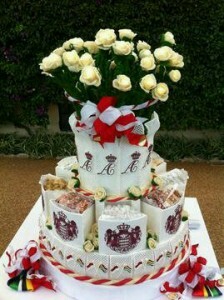 This cake was gifted to the couple by the Mullot Bakers on Monaco. I like how it incorporates candy, flowers and cake all in one. What do you think? All my info and the picture came from the Visit Monaco Facebook page…you can go there and check out all the highlights from the wedding day.